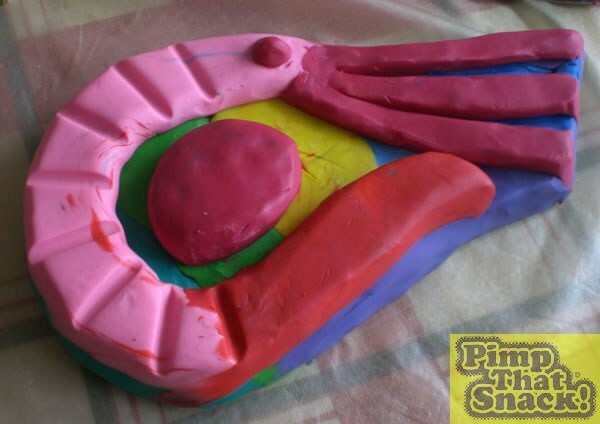 An experimental attempt to make a giant version of a childhood favourite - Pink Shrimps. 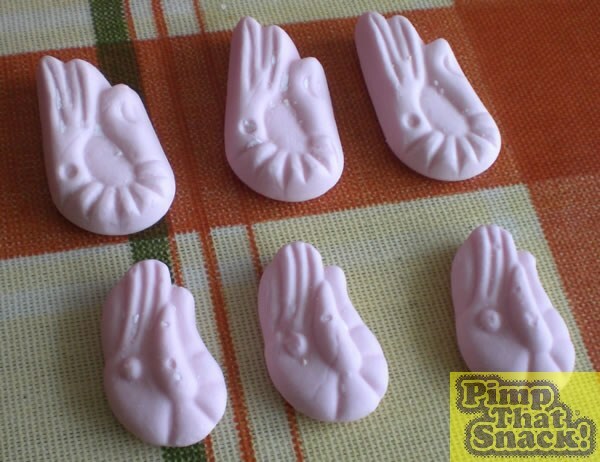 Pink Shrimps are a sort of hard marshmallow candy, sometimes unromantically labelled 'foam shapes' - and sold alongside a similar-textured article known as 'foamy bananas'. These are really popular and traditional sweets in the UK - not sure about the rest of the world, but I do know something similar is available in the USA, called Circus Peanuts. Examples from two different varieties of Pink Shrimps (from two different shops) are shown here. 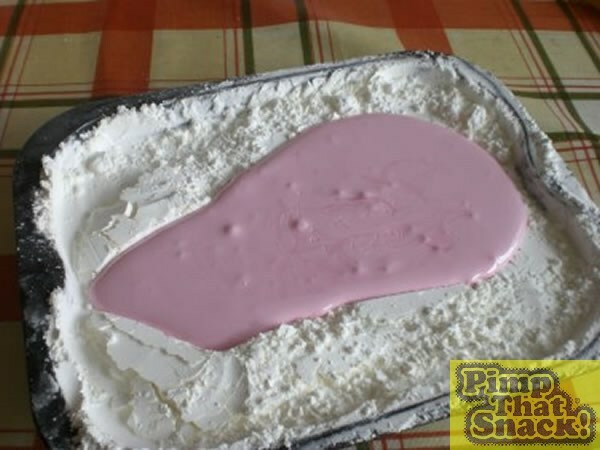 To make a giant Pink Shrimp, I'll need a mould - and the problem with any kind of sugary confectionery is that we can expect it to be really sticky. 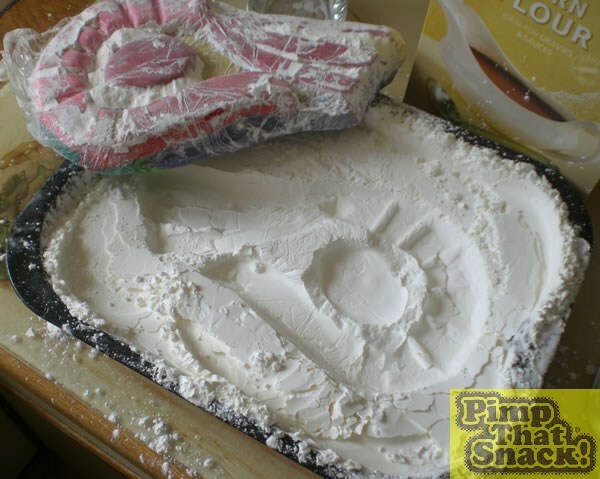 In commercial-scale manufacture of sweets, this is often managed by moulding the candy into impressions in a tray of corn starch, which is what I'll be attempting here. 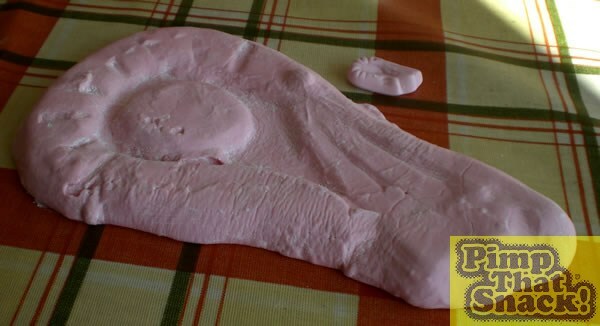 First I need something to make the impression though - Plasticine to the rescue! 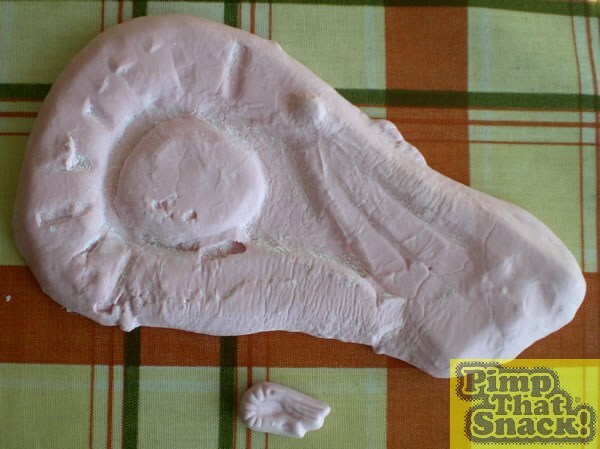 My positive pattern for making the cornflour mould is about ten times the length of a standard pink shrimp. 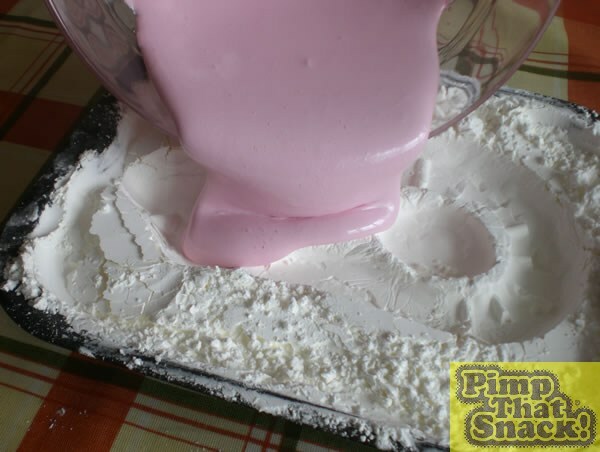 To prevent the cornflour ruining my Plasticine, I carefully covered it with plastic cling film, then I chilled the Plasticine form in the fridge, to harden it up. Making the impression in the cornflour took a bit of trial and error - if the powder is left loose, it squirts out everywhere when the form is pressed in. If it's packed down too tight, the form doesn't make a deep enough impression. In the end, I discovered that it was best to pack down tightly around the rim of the tray (using the flat base of a tumbler), leaving the centre completely loose, then press in the form, pulling it back out by the tails of the cling film. 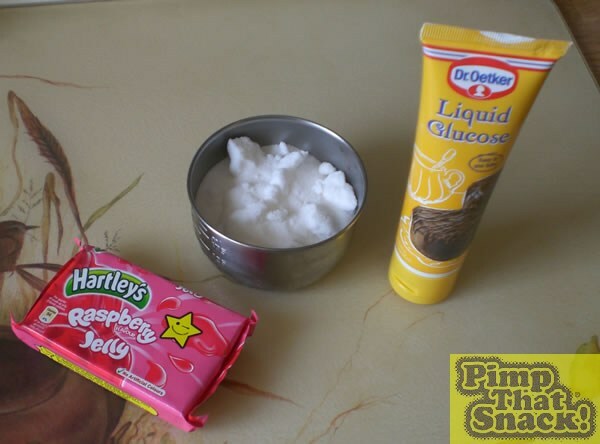 The ingredients for the shrimp: 100g of glucose syrup, 125g of white sugar and 135g of raspberry flavoured gelatin. Jelly (which you may be accustomed to calling Jello) is most commonly available (here in the UK) in the form of a rubbery brick, rather than crystals or powder. 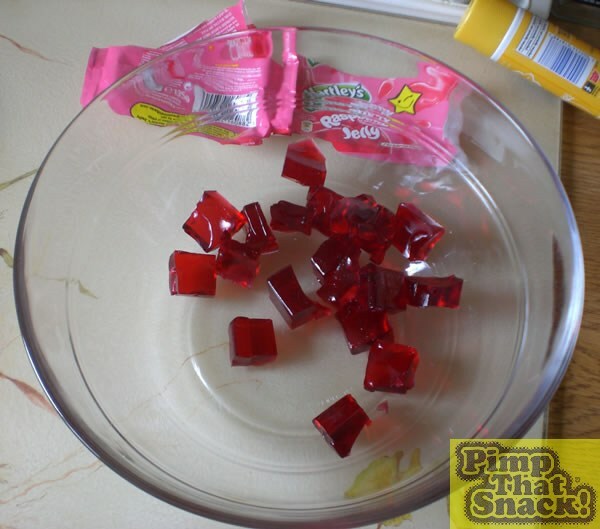 I cut the jelly cubes up and put them in a large pyrex mixing bowl (resisting the temptation to eat any). I put this in the microwave and set the timer for 45 seconds, but didn't press start, just yet. I put the glucose syrup first into a pan, with the sugar on top. Doing it this way enables the sugar to be melted and boiled without caramelising and changing colour.I heated and boiled the sugar until it measured 115 Celsius (this is known as 'soft ball' stage in confectionery terms, as halting cooking at this point would result in a firm, toffee-like material that could be rolled into balls and flattened without cracking). 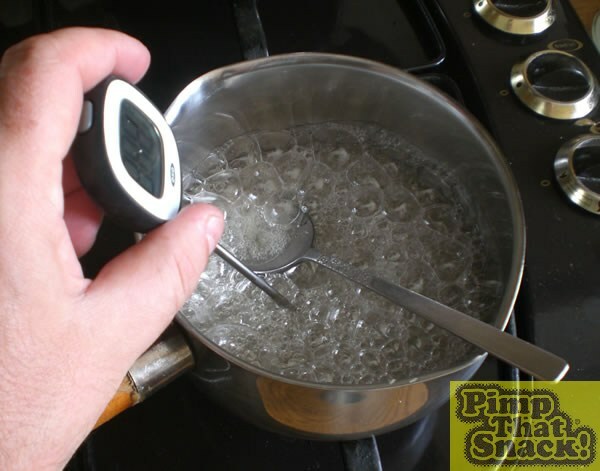 I set the microwave going to melt the jelly. As soon as the jelly was finished, I had to work fast (but with great care - melted sugar is sticky and hotter than boiling water). I poured the melted sugar slowly into the melted jelly, at the same time as whisking with an electric hand whisk. (I don't have a picture of that precise stage, as both of my hands were busy, as well as all of my attention being focused on the job at hand). 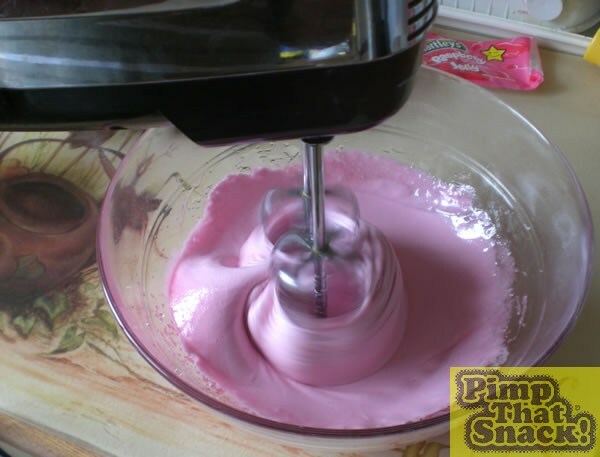 A few minutes of whisking turned the mixture from a deep red syrup into a pale pink foam.Time to pour. 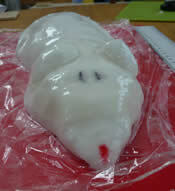 Although sticky and stringy, the mix was still fluid enough to pour into the mould. With great care, I poured it slowly into the lower-lying parts first, in an attempt to preserve the ridges and details of the cornstarch impression. There was just the right amount of mix to fill the mould. I left it to cool for an hour, uncovered. Later, I covered the top surface of the setting marshmallow with more cornflour.Then I placed it in the fridge for several hours. I probably should have left it to set overnight, but my curiosity and impatience got the better of me. I turned out the Atomic Shrimp and dusted off the excess cornflour - not bad. Some of the details hadn't come out as brilliantly as I might have hoped, but you can definitely tell what it is. It's a good deal softer than its diminutive commercial cousin, but I'm not really sure there's much I can do about that - I suspect the manufacture of hard marshmallows requires either dessication equipment (to extract more moisture than can be achieved by natural drying), or pressure injection kit, to force a firmer mix into the moulds (which might not work at anything but a small scale anyway). The texture of my giant pink shrimp is like very stretchy marshmallow - admittedly, not very much like the firm, almost crumbly texture of Pink Shrimps - the raspberry flavour isn't right either - I think the commercial ones are mostly synthetic vanilla-strawberry, however, mine is nice enough in its own right - definitely recognisable as confectionery, just not quite what I was aiming for.